Nigel Cassidy is an established BBC reporter and presenter, best known for the years he spent getting up in the middle of the night to present the business news on the BBC Radio 4's Today programme. He now enjoys a more roving brief. Apart from being a regular on BBC News 24's nightly Business Today programme, he is currently working on a four-part landmark series about privatisation for BBC World Service called The Global Sell-Off. He is also making a BBC TV programme about the pensions crisis. Nigel has also travelled in Europe, Asia and the Americas writing and presenting Workers Without Frontiers, a six-part series about labour migration. 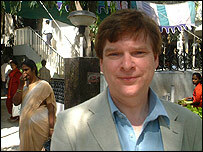 And he has created and hosted several BBC Radio 4 series including Shelf Lives and The Board Game. Nigel is particularly interested in how businesses, entrepreneurs and digital technologies are changing the way people work and live all over the world. His journalistic career began in print before he joined the BBC in Sussex, later moving to produce and present at Radio London, BBC Westminster and the old Financial World Tonight programme. His unfulfilled ambition is to read a whole newspaper, journal or magazine entirely for pleasure without tearing something out of it for future reference.